From 2001 through 2013 we were involved in extensive research based on the three leading bestseller lists. As described below, the work started with Tyndale House Publishers and then passed to Simba Information. We were priveleged to do this research during a pivotal time for the publishing industry, when strong traditions built up over most of the 20th century begun to crumble in the first decade of the 21st century. Unfortunately, as a result of those changes and the "Great Recession," the division of Simba Information we had been working with was closed by its parent company (MarketResearch.com) in December 2013, and we were not successful in finding a home for this work. It remains, however, a solid example of the type of research and analysis in which we excel. 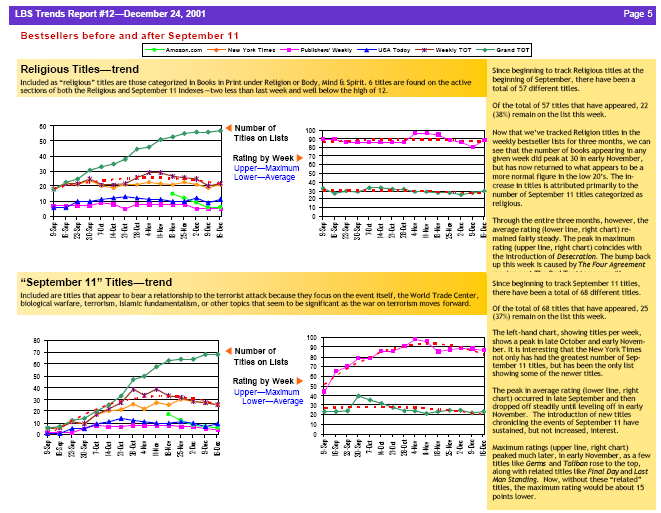 Also see: Samples of Top-25 lists by time period, Insight Reports, and Graphs. Tyndale House Publishers had a mega-hit on its hands in 2001, the Left Behind series, which was making waves on the bestseller lists. Looking for additional angles to use in publicity, we were asked to study the bestseller lists, which led to the present database. As the database matured, various types of reports were generated, from regular summaries to detailed analysis performed to answer specific questions. For example, because we started the database a few months before the September 11 terrorist attacks, we were able to track trends in books on religion, Islam, and terrorism over the following months. By 2006 the Left Behind series was winding down and Tyndale dropped its support of the project. We continued to maintain the database, focusing on the weekly lists, in hopes of securing another outlet. What developed was a relationship with Simba Information, which began in early 2007 by supplying reports for use in their monthly electronic newsletter Book Publishing Report (BPR). 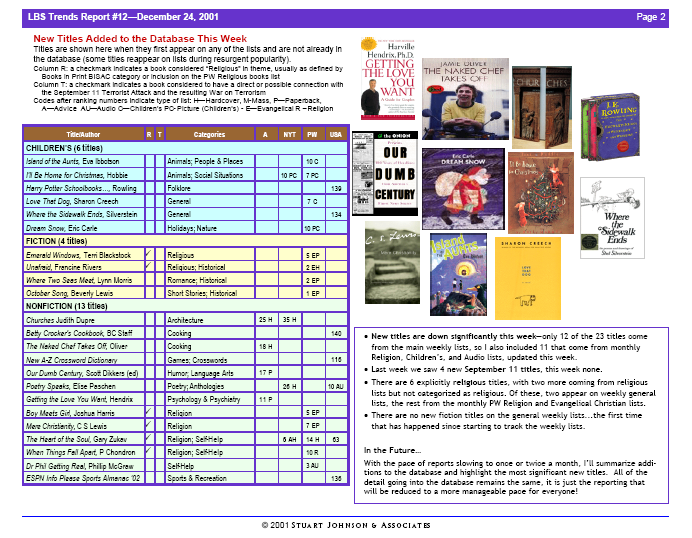 Two standard reports were produced each month: a Scorecard summary of statistics for the previous month, and a Category Review, which looked at trends for a specific category of books, starting with the previous four quarters and then looking for trends over five years. In addition, a number of special reports were produced through the year, looking at such things as a comparison of top publishers, children's books, pricing, and other topics. Sadly, the economy and changes in the publishing industry brought BPR to a close at the end of 2013. The links below provide examples of our work toward the end of that period. See the Top Bestsellers page showing the final weekly update of the top-25 bestsellers by consolidated ranking across the three lists. This is a good example of the type of data analaysis and presentation we do. See Bestseller Insights and Bestseller Trend Charts for examples of ways that we were able to mine the data and make it available in a variety of ways.